It's the first Wednesday of the month! 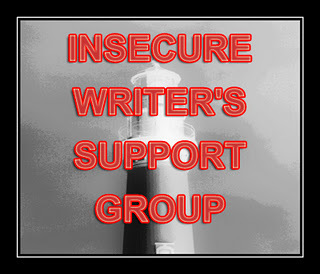 Time for the Insecure Writers Support Group! I wasn't going to post anything today becasue I just got done with the A-Z madness and I thought I'd be all blogged out. However, my insecurities are taking over today and I need to vent. Normally, I hate to be a downer. If I post something negative I at least try to leave it on a positive note, but I can't promise anything with the mood I'm in. So this past month I've been doing a lot of beta reading (for me that is. I'm not Christa Desir). I haven't read a single published book becasue of it, even though I've been exceeding my book a week goal, and believe it or not, that's left me insecure. I know this will go away, but right now I feel like everyone is better than me and I'll never amount to anything becasue I can't compare to the awesomeness. Yes, I shouldn't compare myself. But... it's kinda hard when you put yourself out there and risk criticism from strangers. In all seriousness, I'll get over it. I'll find a writing groove and think I'm a genius for about 5 seconds. Until that time I'm just going to fake it until I make it. The funny thing about comparing yourself to critique partners is that they often are doing the same thing! They are probably reading your stuff thinking, "why can't I be this good?" You shouldn't really compare yourself to others, even within your own genre. Each writer brings something different to the table, even if not all readers and critiquers click with it. It's hard not to compare, whether it's their craft, their beauty with words, their writing speed, the amount of time they spend writing or blogging, we can always find someone better than us to compare ourselves to. BUT, none of them are you, none of them see things the way you do, or describe them the way you do. You are unique and because of that you do have something to offer the world. Faking it until you make it works! Besides, you're better than you realize and if you keep writing you'll see that. I reckon we're all hard on ourselves! I bet if someone was beta reading for you they'd be feeling insecure because of your awesome writing! Definitely feel like this myself quite a lot! My post today touched on those similar feelings. I think most writers feel like this because you naturally compare yourself all the time and we learn so much from each other too. Oh yeah, I have this feeling a lot. It's really hard not to compare yourself to others because they're right there and they've given you their stuff to critique. I think part of it is that publishing has so few real milestones to cross. Sure, you can mark your journey by things like your first rejection letter and when you sign with an agent, but for most people the first rejection letter and signing with an agent can be years--decades!--apart. Between those points, it's hard to see the progression of your skills. Though I agree with Rachel, they might be reading your stuff and wishing they could write as well as you do. I loved your post and really appreciated all the encouraging responses you received. Just have to say I agree-- the comparison disease is rampant and also futile. Keep believing in yourself Jennie. I think comparing to oneself is the worst medicine, but if you think positive, you may feel better. I know you'll be able to pick yourself up and continue writing. You can do it!!! Love that line "fake it until you make it". :) Really, the writers who aren't insecure about their work, who think everything they write is gold and glittery, probably don't exist. Keep on keeping on, and believe in yourself! I can completely see where you're coming from, and like you say positively at the end, you'll get over it. All you can do is be the best you can be, and don't let second best slip through. And read something you think is really rubbish - that always makes me feel so much better! I'm in the fake it til I make it phase myself. It's hard to turn off the comparing part of my brain, so I totally feel where you're coming from. Just explain that you're swamped when you tell people 'no'. But you'll need to tell them no sometimes. Really. It's so hard not to compare. This happens to me after I finish reading a particularly awesome book. But instead of letting it drag you down, use it as motivation to make your writing stronger. No one writer is the same, we all have our strengths and weaknesses. I'm sure when your CPs and betas read your stuff they probably feel the same way you do. We live in a very comparative culture. If you live in Utah, it's even worse here. People all suffer from an external locus of identity. I think it's safe to say that everyone feels this way. I know I certainly do, whether it comes to writing or art! Makes it way too easy for me to feel dejected everyday, so I do my best not to compare myself to others when I can, since that'll just keep me from my creativity, which is never a good thing. Good luck reaching the stage where you're "making it" instead of "faking it"! Find your groove and screw strangers. Fake it until you make it. That's something a therapist said one day about something and although it took me several years, it worked. I hope you get there much faster. That much beta reading and critiquing (when done well) is a drain on a person. Your perspective on their work--as well as yours--is exactly that: a perspective. Things look differently from different perspectives and our position determines our perspective. My guess is that once you've recovered and recharged a bit, you'll see your work and self in a more positive--and realistic--light. When insecurity knocks, open the door, let it in, and then promptly strangle it. Oy! We're so hard on ourselves, right? But you read some of these comments and it's plain to see...you're not alone! I do not know if you're a misunderstood genius of writing, the blogosphere is full of people feeling of it. For me writing at least 30 years old and I write in Italian (it could have been otherwise). But I'm curious, very curious and I think this medium that we use so often and in all parts of the world, is often wasted. Not unites different cultures and emotions, we need only to communicate more frequently similar between the same area. It 's my strictly personal opinion I know well, however, I happened to get here and read (helped of course by an online translator) what you write. Immediately after it seemed natural to propose my lyrics and my world I think is very different from yours, to do this I am translating my lyrics in English (please do not laugh too much for my translation). It seemed like a good idea and I will offer it simply, if you like just let me know, this invitation is also true for your commentators that slowly I will go to visit. Thanks for the hospitality. I think these feelings are completely natural, maybe even healthy for a writer to have, assuming they're not out of control. How can we improve if we are not aware of our own failings, right? I go through phases where I have a hard time reading because I can't help comparing myself to the authors I read. That is a hard funk to break out of. I think the way we have to look at it is like this: we all have something different to offer. We all have different strengths. That doesn't make us better or worse than anyone else. Besides if we're looking for someone better than us, we're always going to find someone that is. We just have to acknowledge it and keep trucking along. You know how much I love your stuff. You don't have anything to worry about. There are so many good writers out there it's often hard not to feel intimidated. Just remember everyone has something different to offer. One of my teacher's advice, "Keep your eyes on your own paper" doesn't just apply to just tests at school. You're doing great, Jen. Forward movement is the key! While I'm sorry for any injury to your self-esteem, the people privileged to have you as beta readers ought to feel pretty great with that sweet praise. Hopefully the intimidation wears off soon, though, because you have obvious talent. I know what you mean; I do it too. I hear ya. I go through this at least once a week. However, I know you are a great writer. You had an agent tell you that at PPWC and I heard your first page. I thought it rocked. So ignore the doubt and know that one day someone will be thinking the same thing about their writing when they read your work.